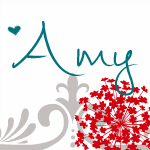 It’s Surprise Recipe Swap day today and I was assigned Aimee’s blog, See Aimee Cook! Aimee is a Texan who loves to cook for her husband and three dogs! Cooking is Aimee’s passion turned stress reliever. Aimee has a lot of wonderful recipes on her blog, but I was instantly drawn to her Rosemary Iced Coffee! I’m learning to love coffee, though I’m more of a Starbucks or “cheat and use instant coffee” than a “brew my own” type of gal. So I was totally intrigued by the idea of cold brewing coffee. The cold brew worked amazingly well, but here’s the thing. Below I have written half of the batch of coffee. Do you see quarts down there? Yeah, that’s a gallon (the original calls for a pound of coffee & 2 gallons of water!!) That is a lot of coffee! So here are a few things to think about before cold brewing coffee. First, be sure you have a large enough pot to brew it in (I don’t, thus the reason I made a half batch). Second, be sure you have a plan and containers in which to store the coffee once it’s been brewed! I stored about a quart in a pitcher in the refrigerator and froze the rest in quart sized bags, because I love iced coffee, but how much can a person possibly drink in one day? As far as the Rosemary Iced Coffee goes, I am totally in love! I’m a rosemary fanatic, so I love the surprising earthy twist the rosemary brings to the table. I’ve also experimented with half rosemary syrup and half vanilla syrup, which is also an amazing combination. Rosemary syrup would also be amazing in tea. Oh and maybe a margarita…ooohhh…I’m going to try that out this weekend! Thank you Aimee, for a wonderful recipe! Place all ingredients in a large cup. Stir to blend with a stir stick or straw. Enjoy! Combine the water and coffee in a large stock pot, stir to combine. Cover and let it sit for 8 hours or overnight. Strain out the coffee grounds through a colander lined with cheesecloth (or paper towels). Discard the grounds and store the coffee in the refrigerator. Place the water and sugar in a small saucepan over medium heat. Stir and heat the mixture until the sugar is completely dissolved. Add the rosemary and bring the mixture to a light boil for about 5 minutes, still stirring frequently. Reduce the heat to low and cook for an additional 10 minutes, stirring occasionally. Remove the pan from the heat and set side for 20-30 minutes (the longer the mixture sets the stronger the rosemary flavor will be). Remove the rosemary sprigs and place in an airtight container in the refrigerator for up to 2 weeks. Be sure to check out the other SRS submissions here! My husband hates rosemary, so I never have a chance to use it in my cooking - That makes this recipe so perfect for me! I would have never thought of putting it in my drinks! Love it! I have been using a lot of rosemary and this sound so good... I have never made cold brewed coffee... I just use the leftover coffee but I am going to try this... I love SRS, so many great recipes. Pinning this so I can make it. This sounds amazing! Great SRS choice! This is really interesting. I love iced coffee. I'll have to try it. This is my first time at SRS. Hope you will visit me too. I made the pancake and fruit kabobs. I would never have thought of this flavour combination! That sound very intriguing, Amy! I can already imagine all the things I am trying with Rosemary syrup :) Great pick! I bet this is REALLY good! Thanks for sharing at Pinworthy Projects.